As the Conservatives head for their annual conference at Birmingham today, they will at least be grateful that theirs is the final major conference of the season. This both enables them to respond to the challenge laid down by Labour at their conference last week, and also puts the maximum distance between Mrs May’s embarrassing failure at the recent EU summit and her conference speech next Wednesday. That does not make either of the issues less serious, though. The Labour party had a good conference; they are increasingly putting forward policies that deserve attention and proper consideration, and they are beginning to win respect and even some support from the fabled middle ground where British elections are usually won and lost. The divisive issues that could have wrecked the conference were well managed, and even if their leader, Jeremy Corbyn, did not attract quite the rock-star adoration of his Glastonbury appearance in summer 2017, he put on a competent enough performance and is maturing into a serious contender for office. It is easy to forget that few leaders of the Opposition look like statesmen before they become prime minister. The office itself confers dignity and stature and Corbyn is by no means the weakest leader of the Opposition of recent times – an accusation which certainly could have been levelled at him 18 months ago. The Conservatives know this, and fear that unlike at the last election, the warning “vote Labour, get Corbyn” is unlikely to scare wavering voters back to the safety of their side. Their challenge is that on the issues that the Labour party is prioritising, they have no real answers – and on the single issue that they themselves are prioritising, they have no answers at all. That single issue is of course Brexit, and once again it will dominate their party conference and once again it will demonstrate quite how divided the party is. And, after the brutal rebuff that Mrs May and her laboriously constructed Chequers plan got from the EU-27 earlier this month in Salzburg, there isn’t even anything obvious for the dwindling band of May supporters to rally round and demand allegiance to. It is hard not to have a little sympathy for Mrs May and the way she was treated in Salzburg. She was put bottom on the long agenda, and had to wait until the middle of the night to address what was by then a tired, fractious and dispirited group of heads of government who had just endured several hours on the real issues that worry them, viz immigration, populism, the disobedience of the “Visegrad 4” and the growing threat of a radically hostile government in Italy, only to find that all four were impossible to resolve. Given that she was only there for the one agenda point on Brexit, it was the height of rudeness to make her eat alone in a side room and then wait and wait – it would have been easy, and much more courteous, to allow her to speak first (and before supper, so she could then leave). And one cannot deny that the EU could have done a bit more to be constructive. It is poor diplomacy to sit there for two years and just repeat, in effect, “The answer is no; please come back with another plan” without putting forward very much yourself. It is not entirely surprising that Mrs May was a bit fed up with their attitude, and that her Foreign Secretary, Jeremy Hunt, called for more respect for the efforts the British government were making to address the issues. The EU will say that they have in fact offered two solutions, viz a Canada-style free trade agreement and a Norway-style “membership-lite”. 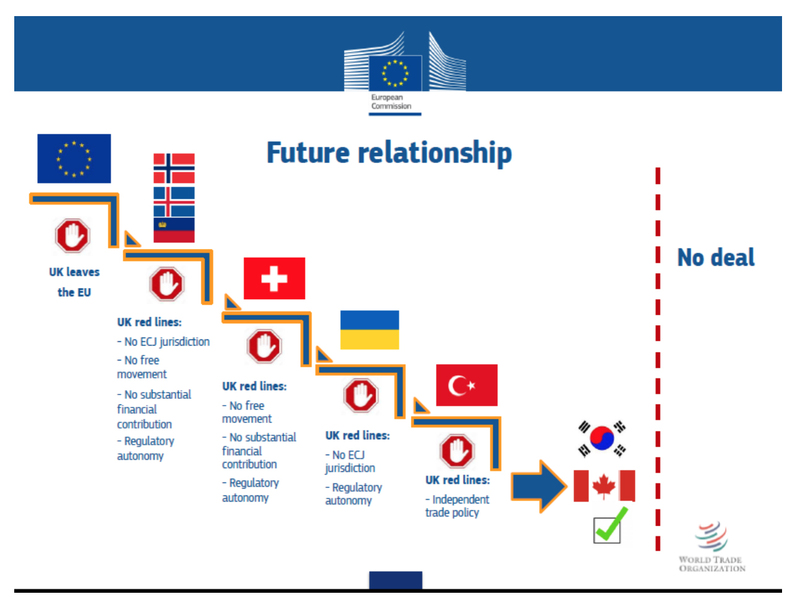 But since they know that large parts of the UK would not accept (and anyway Mrs May could not get through Parliament) a Norway-style deal, they have in effect only offered her a Canada-style one – as has been clear right from the start of the negotiations from Barnier’s famous chart of the UK’s options (see here). But the EU has a problem with this, which is that it means a hard border in Ireland. And the solution they have offered to that, viz Northern Ireland inside the Customs Union and Great Britain not, is both so clearly unacceptable to the UK as a sovereign state (the last time one sovereign state dismembered another in peacetime like this was Munich 1938), and so clearly the most rank piece of cherry-picking of all (“we want this part of your country but not that part”) that any reasonable person would say they have not really tried very hard at all to find a solution that works. For all that, the fact remains that Brexit was a unilateral UK decision, and the EU cannot be expected to agree to anything that goes against its interests. It is, as we have observed on many occasions, a rules-based organisation and the UK is continuing to demand a future relationship which is outside the rules at a time when the internal stresses of the EU argue very strongly for sticking to them. The reality is that there isn’t a plausible relationship that the UK could construct as a non-member which is anywhere close to the balance of rights, freedoms and obligations of being a member, yet the UK is still trying to secure something which is. And there is a strong feeling in at least some European capitals that the EU should not bend its rules just to accommodate a dysfunctional government in the UK which has created many of its own problems by calling and then faring disastrously at an unnecessary general election last year. Having said all that, Mrs May is her own worst enemy. She is unimaginative, lacking in self confidence and stubborn. She has no personal friends in the Council (even David Cameron was more liked) and simply cannot do small talk to make up for this. She has a tin ear for what others really think (though her advisers could and should make up for this in their briefings), and is unable to sense when the mood is going against her or switch on the fly to a Plan B. She is the very epitome of someone who, when in a hole, keeps digging. Worse than this, like many stubborn people, when she does give way, she does so on the wrong things and at the wrong time. As perhaps the worst example of giving way on the wrong things, she allowed herself to be arm-twisted into getting rid of Sir Ivan Roberts, the UK’s Permanent Representative at the EU (and so chief negotiator) until January 2017, and, as my good friend and fellow political commentator Alastair Newton has observed, the one person she should have had right by her side throughout the whole Brexit process. And on the latter, by initially hanging tough on the issue of EU citizens’ rights in the UK after Brexit, she has been forced to concede more and more while getting nothing in return, until now the UK government has virtually promised all EU citizens unchanged and undiminished rights, while securing no such promises for UK citizens in the EU. Mrs May’s supporters like to picture her as an embattled but determined leader: a second Winston Churchill, standing fast amidst adversity as friends and allies fall away. We think a closer analogy may come from much further back in her country’s history, indeed 1,000 years back to King Ethelred the Unready. Like May, Ethelred faced a problem from the Continent – in his case fleets of raiding Danes wreaking havoc with England’s economy – and like May, Ethelred tried in turn resistance, concessions and paying large sums of money. None of these worked, and the embattled Ethelred has gone down in folklore as one of England’s least respected kings – ill-starred, ill-advised and ultimately, unsuccessful. It is a verdict that Mrs May is increasingly at risk of sharing. The SNP conference is still to come; it will be in Glasgow from 7-9 October. But this is likely to be a more than usually inward-looking and Scotland-focussed SNP conference, and on the travails of the Conservatives over Brexit, the SNP has very little new to say. The “Visegrad 4” are Poland, Hungary, the Czech Republic and Slovakia. The first two are in open defiance of the EU on various matters, and the second two largely agree with them and provide support in the Council discussions. The EU has started disciplinary proceedings against the Hungarian government, but with any sanction requiring unanimity among the other governments, they stand no chance of imposing anything significant: Poland will always veto sanctions on Hungary and vice versa. King of Saxon England from 978-1016. The epithet “Unready” does not in this case mean “unprepared”, but comes instead from the Saxon word “unræd” or poorly advised. It is a pun on his name, which in Saxon was Æthelræd, meaning “well advised”.